to make the perfect piece of jewerly. Bianca’s Fine jewelry invites you into the wonderful world of fine jewelry and the special moments that a gift of jewelry helps express. Whether it’s an engagement, an anniversary, or just because, fine jewelry is a special way of expressing your inner feelings. At Bianca’s Fine Jewelry, you’ll experience the true passion of what jewelry is all about. Let us help you make a special memory this year with the fire of diamonds, the richness of stunning colored gemstones and the beautiful luster of precious platinum and gold. Love, excitement, happiness, pride, and joy . . . emotions that are expressed with jewelry. Bianca’s Fine Jewelry helps you express your true emotions with the perfect piece of jewelry. When the little blue box from Bianca’s Fine Jewelry is opened, the meaning of those special emotions are conveyed. 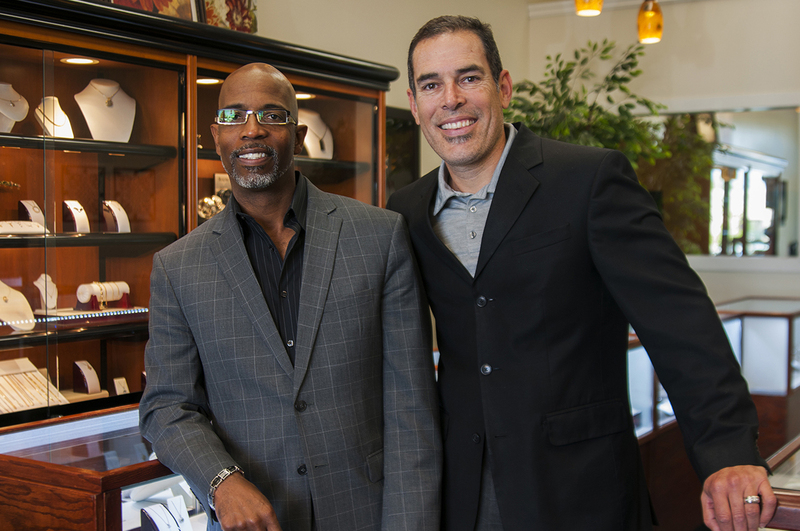 With over 60 years of combined experience, Keith Greene and Chalo Luna are proud of serving their community with the very best in jewelry values and the utmost attention to personal, caring service. We want you to look at Bianca’s, not as another jewelry store, but as your personal jeweler. We look forward to assisting you with all of your jewelry needs. We invite you to come and experience the true passion of what jewelry is all about.